If you’ve been following this five part series every week then welcome back for the final installment where we’ll be covering YouTube. If however you’ve just joined us then welcome! To bring you up to speed we’ve covered a number of social video networks, so if after reading this you think YouTube is not quite the right fit for your brand then you may want to take a look at our blogs on Keek, Vine, Vimeo and Instagram. YouTube is part of the internet giant that is Google. Believe it or not but YouTube is less than 10 years old; the domain was activated in February 2005. YouTube was founded by Chard Hurley, Steve Chen and Jawed Karim. During 2006, YouTube was one of the fastest growing sites on the web with 65,000 new videos being uploaded every day and serving on average of 100,000 million video views daily. It was in 2006 that YouTube was purchased by Google for $1.65 billion in stock. YouTube is very straightforward to use and if you get stuck there are a multitude of help guides available to assist you. After creating your account you can begin customising your channel with branded artwork and a description of what your channel is about and what users can expect to see in your videos. You can also add web links to your official website and social media profiles to drive visits and followers. To upload a video simply click the upload button at the top of the screen at the end of the search bar, from there you’ll be taken through a step by step process to optimise your video with descriptions, tags and categories. If you feel your videos need some enhancing after you’ve uploaded them, you can add filters, annotations and audio to them using the video manager. Once you have around 5-10 videos, it’s good practice to set up playlists to organise your channel. You could base your playlists on different products, for example Go Pro have a playlist for their TV commercials, their favourite fan videos, events such as the X Games and also tutorials for their products. The benefit of a playlist is two fold, it allows users to navigate your channel more easily as well as giving users the ability to automatically play all of the video in a list. 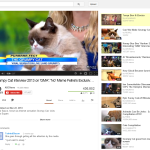 As more and more people switch to smart TVs the value of a YouTube playlist is almost certain to grow. Once you’ve uploaded a few videos it’s time to start using the analytics. Compare the average view duration between your uploaded videos to see which one was viewed the most and which one has the longest average view duration. What makes these videos different? It might be the video which gets more clicks has a really eye catching thumbnail icon or the title could pique interest. The video which has the longest average view time could have more interesting content or the title and thumbnail better represents what is on the video; so users which clicked to view it got exactly what they expected. Videos which have a high click rate but low average view duration suggests that the title and/or thumbnail for that particular video is leading them to expect something different from that which your video shows. As you identify trends and elements which work, apply them to videos you create and upload in the future. It would probably be better to ask who doesn’t use YouTube. The rapidly growing site receives one billion unique visits every month. Every single minute, 100 hours of video are uploaded to YouTube and every month 6 billion hours of video are watched (YouTube states that’s equal to almost an hour of viewing for every single person on Earth!). Currently YouTube is localised in 56 countries and a jaw – dropping 61 languages. Due to the effort that has been made to make the site accessible to everyone, 70% of YouTube’s traffic now comes from outside the US. YouTube is more popular with men with approximately 55% of the users being male and 45% female. The predominant age range for YouTube users is 12-17, however according to Nielsen, YouTube reaches more US adults ages 18-34 than any cable network. So, if a large, global audience is an important element to you, then your brand will be right at home on YouTube. 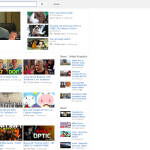 This is what the YouTube home screen looks like to a user which is not logged in. 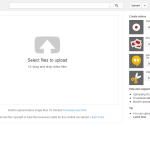 This is the screen you seen when uploading a video to YouTube. 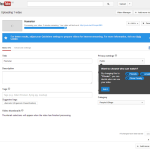 Whilst your video is uploading you can start filling in the description, title and category. 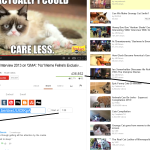 Along the right hand side of the page you can see all the videos that YouTube suggests to the user – based on their viewing history. This is the tab which users navigate to in order to share a video. Discover how users can interact with your videos. Keep track of competitors by checking their video stats to see what’s working well for them. 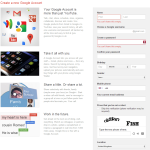 Make your videos searchable by adding descriptions, tags and categories. Separate videos about different products or services into Playlists so that your channel is easy to navigate for users. Embed your YouTube videos into your website or blog to expand their reach and to grow your views. Add a link to your website in the video by setting up your Associated Website. 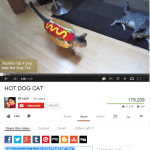 Use annotations to add calls to action to your video. YouTube recommends videos similar to those which the user has just watched, which means increased potential exposure for your videos (however this also comes as a negative). Users can easily find new content (including yours) through recommended channels or browsing categories. It’s easy to manage a bulk of videos using the video manager. Make them public, private or unlisted. Enhance your videos with filters, captions and audio voice overs. YouTube is used by people all over the world and every month over 6 billion hours of content is watched on the platform. YouTube is available not only on desktop but also via smartphone apps which means it’s easily accessible to users wherever they are. You can get in-depth analytics about your videos including how many views, where those views came from and view duration. 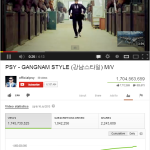 Similar to Google analytics, on YouTube you can also compare metrics to identify underlying trends with your audience. Easily share your videos once you’ve published them to outside social networks like Facebook, Twitter and Google+. Users can engage with your content by Liking or Disliking it, commenting on it, sharing it or adding it to one of their playlists. Like Keek, brands can respond to user comments left on their videos with another video which is a great way to show dedication to your audience by going to the effort of creating a video especially for them. YouTube is free to use for both brands and users. There is an abundance of competition and not only from your direct competitors. If you take the time to watch a video on YouTube you’ll know that the site suggests other videos for you to watch so before you know it you’ve gone from watching a video about Photoshop for beginners to watching a horse and goat play with a giant football. In short, what we’re saying is that there is a wealth of great content on YouTube that will work in distracting viewers away from your videos. YouTube has the ability to be quite complex, so if you are looking for something a little “lighter” than your brand may be more at home on another social video sharing network. There are lots of boxes to tick or untick that you may not know about. For example you may not want to allow others to embed your YouTube video on their blog or website, so in order to prevent this from happening you need to untick the appropriate box in your channel settings. Although you can change the layout of your YouTube channel, it is still not as easy for users to navigate as other social video networks. Most users are more familiar with updates working in a reverse – chronological order whereas YouTube just displays the playlists. Which Brands Does YouTube Work Best For? YouTube is used by a multitude of different brands, from magazines and newspapers to celebrities and software companies. YouTube is ideal for brands which produce a lot of video content because the platform is proficient for managing it all. If you have only one or two videos then you could find that they get lost in the mass of content from other users. Many brands use YouTube to showcase their products or create video tutorials on how to use them. Some brands use YouTube to re-purpose their television ads whilst others showcase customer testimonials. Brands such as magazines and newspapers can share videos of interviews or behind the scenes action on photo shoots, authors could create a video of them doing a reading from one of their published books. The possibilities are endless because the maximum video upload limit is 15 minutes and this can even be expanded to over an hour upon request. YouTube is also a great place to host your YouTube videos, you can upload them on the site and then embed them on your website, so instead of driving traffic to YouTube you can still drive it to your website. This brings us to the end of our five part series on social video sharing networks. We hope you enjoyed the series and it has helped with your decision of which network or networks to choose. We’ve no doubt that Keek, Vine, Vimeo, Instagram and YouTube will add yet more fantastic features to their services so this is certainly not the last you’ll hear from us on the topic. If you’re fed up of hearing us talking then why not leave us a comment with your thoughts in the box below. If you found this five part series useful then don’t forget to show your friends some love by sharing it with them too.